After Snow Hill the Explorer headed for an afternoon landing at Devil Island. The last three landings had offered scenery and history but not much wildlife. This was about to change in a major way. From the moment we touched shore at Devil Island we were overwhelmed with penguins. Adelie penguins were everywhere – nesting, foraging, squabbling, marching down to the sea in the proper parade form favored by their species. It was Penguin City! 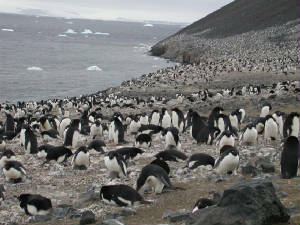 Thousands of penguins had staked their claims all along the shore and were settled down on nests built of beach pebbles. Like human homes, some nests were substantial and well constructed; others were scarcely more than a spot on the rock. Suitable building materials were at a premium, and Ken, our bird expert, told us that penguins were fairly adept at stealing rocks from each other’s nests. Even now with the nesting season very well along, birds were still picking up stray bits of gravel and carrying them back for a little bit of home improvement. 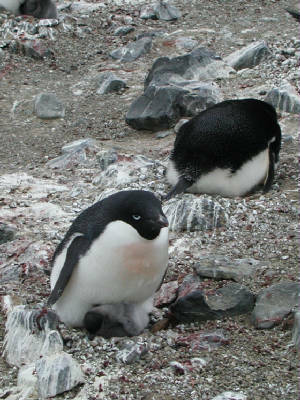 Many of the nesting penguins had one or two fat gray chicks tucked under their breasts. Others still had unhatched eggs. I spied two penguins with chicks still in the process of struggling free of the egg, with a minimum of help from the parents. Penguins are actually quite involved parents, feeding their young as they do by regurgitating partially digested fish – a process that adds to the pungency of the penguin nesting area. Penguins need to stay quite literally on top of the chicks for at least four weeks, because marauding skuas and sheathbills are always on the lookout for an unguarded egg or chick. There were plenty of these “bad guys” – the sharp-eyed skuas flying overhead and the chicken-like white sheathbills hopping around and trying to get a peck of whatever is available. The penguin parent on the nest might be male or female because the birds take shifts, one parent guarding or incubating while the other is out feeding at sea. I observed one pair perform the ritual of changing places. As one parent arrived from the sea they both stretched their necks skyward, crowed, flapped their wings, and waved their necks in a display of penguin affection. Then one bird replaced the other on the nest, giving the mate an opportunity to go back to the sea to feed. Such cooperation in parenting implies a long-term relationship, and Adelies have been shown to stay with one mate faithfully season after season – although divorce does occur, as it does in the human species. So much ornithology and so much penguin smell! We cleaned our boots as well as we could as we left the island, then stepped in a disinfectant bath and scrubbed them again as we came back on board the ship. Nevertheless the smell of penguin seemed to cling to our pants and parkas. Ah well, all other passengers were experiencing the same. Our great luck with weather seemed to have worn thin as we left Devil Island. The ride back to the ship was unusually rough, and the boarding ladder was shifted to the starboard to take advantage of the lee of the ship. There was no looking for wildlife from the deck that evening because a dense fog set in. Later in the evening we became aware that the ship had stopped. One of the passengers reported that she had gone to find out why the engines had stopped and found the captain in the bar drinking a beer. When she inquired why we had stopped, he looked at her and asked, “Would you like to drive in this weather? The truth was that the ship had reached its planned destination for the next day, Brandy Bay on James K. Ross Island just east of the Antarctic Peninsula on the Erebus and Terror Gulf.